Above: A publicity portrait of Aline Towne from the serial Radar Men from the Moon (Republic, 1952). Aline Towne, though she appeared in five Republic serials, is one of the cliffhanger genre’s more frequently overlooked heroines. This is chiefly because Towne’s serial work came in the 1950s, when Republic’s serial budgets were miniscule and writers and directors were forced to rely on stock plots and stock footage; these latter-day outings, though well-made and entertaining, were not particularly memorable. The later serials were helped greatly by their casts, competent and down-to-earth performers that lacked the dash and melodramatic flair of earlier stars but could make occasionally silly scripts seem much more convincing. Towne, with her low-key and realistic acting style, exemplified this type of cliffhanger lead, and thus Republic used her very frequently in their 1950s serials. Her roles in these cliffhangers were frequently limited ones– she spent much of her serial screen time planning strategies with the heroes and only occasionally joined them in adventure–but she was a likable presence in each of her parts, bringing a calm but friendly manner to her characterizations. Aline Towne was born Fern Eggen in St. Paul, Minnesota, but spent most of her early years in Iowa. She acted in school plays during her teenage years, and later won the “Hawkeye Queen” beauty contest while attending the University of Iowa; this contest win attracted the attention of a scout from Republic Pictures, where she began her screen career in 1950, playing one of the female leads in Republic Pictures’ drama/adventure feature Harbor of Missing Men (1950). This film was quickly followed by two other 1950 Republic productions– Aline’s first B-western (Monte Hale’s The Vanishing Westerner) and her first serial (The Invisible Monster). The Invisible Monster cast Towne as Carol Richards, assistant to insurance investigator Lane Carson (Richard Webb). The pair were assigned to track down a master criminal, the self-styled “Phantom Ruler” (Stanley Price), who was using an invisibility device to commit a series of robberies; he planned to use the robberies’ proceeds to recruit an invisible army, but the investigators checkmated his scheme. Invisible Monster’s premise was a somewhat goofy one, but the serial itself was made quite entertaining by its smooth production values and its likable lead performances. Webb was a strong leading man, and the calm and capable-seeming Towne, whose character was supposed to be an ace sketch artist as well as a skilled investigator, was quite well-suited to her role. She accompanied Webb on most of his investigations, exchanged some good banter with him, and generally made the most of what would be one of her largest serial parts. Above: Aline Towne and Richard Webb investigate the Phantom Ruler’s invisibility device in The Invisible Monster (Republic, 1950). Above: Richard Webb and Aline Towne have found a clue in The Invisible Monster. Towne evidently did not sign an exclusive contract with Republic, since 1950 and 1951 found her appearing in Columbia B-movies like Highway 301 and Purple Heart Diary as well as Republic B-westerns like Allan Lane’s Rough Riders of Durango. She also found time to appear as Lara, Superman’s doomed Kryptonian mother, in the first episode of the George Reeves Superman TV series (the show wasn’t aired until 1952). Also in 1951, she made her second serial, Don Daredevil Rides Again. This Republic cliffhanger drew heavily on stock footage from the earlier serial Zorro’s Black Whip, but was a solid western cliffhanger in its own right. Ken Curtis starred as lawyer Lee Hadley, who disguised as the masked “Don Daredevil” to combat a gang of land-grabbers headed by a corrupt politician (Roy Barcroft). Towne was rancher Patricia Doyle, Hadley’s cousin and confidant, who helped him conceal his identity throughout (assuming the Don Daredevil disguise once herself to protect Hadley’s secret). Towne rarely left the good guys’ ranch headquarters in this cliffhanger, but she definitely helped to make the sequences in which Hadley, Patricia, and ranch hand Buck (Hank Patterson) discussed their campaign against the villains seem like natural conversation and not obvious exposition. Above, from left to right: Hank Patterson, Robert Einer, Aline Towne, I. Stanford Jolley, and Roy Barcroft in Don Daredevils Rides Again (Republic, 1951). Above: Aline Towne is menaced by Roy Barcroft in this lobby card for Don Daredevil Rides Again. Ken Curtis, masked as Don Daredevil, is on the right-hand border. Radar Men from the Moon (Republic, 1952), Towne’s third serial, followed closely on the heels of Don Daredevil. This outing marked the beginning of a last-ditch attempt by Republic to create a new serial franchise, centered around their excellent “rocketman” special effects. Aline would become the only continuing performer in this short-lived series of rocketman outings. Radar Men proudly “introduced” a new character, Commando Cody (George Wallace), a government scientist who combated invaders from the Moon and their earthling gangster henchmen with the help of his flying rocket suit. Towne played Joan Gilbert, Cody’s able secretary, who was just as comfortable taking a spaceship trip to the Moon as she was filing papers. Radar Men featured some impressive sets, locations, and special effects, along with a cast that did its best to lend credence to a sometimes unbelievable plot. Towne, with her down-to-earth acting, was particularly good at supplying such credence; she could gravely discuss pseudo-scientific gadgets and anti-invader measures with Cody in a way that obscured the bizarreness of her dialogue. Above: George Wallace (in his rocketman outfit) and Aline Towne have just escaped a plane crash in Radar Men from the Moon (Republic, 1952). Above, from left to right: George Wallace, William Bakewell, Wilson Wood, and Aline Towne treat a captive Moon Man to a meal in a humorous publicity still from Radar Men from the Moon. As a followup to Radar Men, Republic began filming a Commando Cody television series the same year, with Judd Holdren taking over as Cody and Towne reprising her role as Joan Gilbert. Studio executives had originally planned to produce the serial Zombies of the Stratosphere as an additional Radar Men followup, but subsequently decided to convert it into a non-Cody cliffhanger to avoid undercutting the TV show. Zombies (released in 1952), was still very much in the mold of Radar Men, however; Judd Holdren was cast as rocketsuit-wearing scientist Larry Martin and Towne as his secretary Sue Davis–characters identical to Cody and Joan Gilbert in everything but name. These newly-christened protagonists combated a group of Martian agents bent on blowing Earth out of its orbit, so that the dying planet Mars could take its place. Zombies had fewer original elements than Radar Men from the Moon but did manage to creatively recycle footage from a wide array of earlier Republic films. The unflappable Towne again helped to bring some credibility to a gimmicky screenplay, though her role was once more largely limited to that of office aide. Above: Henchman John Crawford confronts Aline Towne in Zombies of the Stratosphere (Republic, 1952). Aline spent most of 1953 playing bits in features and working on various TV shows–including the aforementioned Cody show, which wound up being sold first to theaters as a pseudo-serial and didn’t air on television until 1955. In 1954 she made her final serial, Republic’s Trader Tom of the China Seas–an adventure that was set somewhere in the Eastern oceans and featured large chunks of footage from the earlier Republic serials SOS Coast Guard (1937), Drums of Fu Manchu (1940), and Haunted Harbor (1944). These pieces were woven together into a new chapterplay that managed to be surprisingly enjoyable. Towne played Vivian Wells, the daughter of an seagoing doctor who teamed with trading ship skipper Tom Rogers (Harry Lauter) to help UN agents thwart a Communist-sponsored revolution in the island nation of “Burmatra.” Aline’s part was larger than any of her heroine roles since Invisible Monster; she accompanied Lauter’s character in most of his adventures and aided him in unmasking the spies’ secret leader Barent (Lyle Talbot). This semi-showcase, however, however, would lead to no encores for Towne–Trader Tom was only followed by three more serials before Republic closed its cliffhanger department for good. Above: Harry Lauter and Aline Towne flee a coming cave explosion in Trader Tom of the China Seas (Republic, 1954). 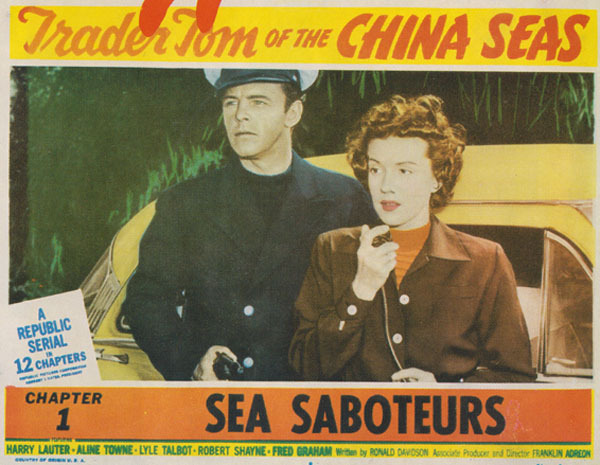 Above: Aline Towne and Harry Lauter in a lobby card from Trader Tom of the China Seas. After finishing her Republic work, Towne became chiefly active on television, only making an occasional big-screen appearance. She appeared on comedy series like Leave it to Beaver and The Donna Reed Show, crime shows like The Lineup, and Westerns like The Lone Ranger, Wagon Train, and Maverick (her excellent performance as a manipulative and vengeful female rancher in the Maverick episode “Trail West to Fury,” should be viewed by any serial fan who questions her acting range). She eased into retirement in the 1970s, devoting much of her time to traveling, although she had a semi-regular role as a nurse on Marcus Welby, M. D. during this period. Her final role came in a 1985 episode of the TV show Airwolf, after which she completely retired. Her husband Charles Waller (they had married in 1946 when Aline was only 16) died in 1986, and she passed away ten years later in Burbank, California. Aline Towne will never be one of the more famous or popular serial heroines, given that she generally played reduced roles in cliffhangers from a financially-diminished era. However, these latter-day serials are still worthy of a serial buff’s notice–as is Towne herself. She dealt smoothly and charmingly with the off-the-wall dialogue of the later cliffhangers, rationally discussing the machinations of invisible men and extraterrestrial invaders as if they were a part of everyday life, and generally upholding viewers’ suspension of disbelief in an attractive and professional manner. Above: Aline Towne with the first of her rocketsuit-wearing leading men, George Wallace, in a publicity still for Radar Men from the Moon (Republic, 1952). Acknowledgements: The biographical information in this article was derived from a single-paragraph bio of Aline Towne published in the Dell periodical Who’s Who in Western Stars (Vol. 1., No. 2, 1952) and from an Internet Movie Database biography written by Marta Waller (presumably Towne’s daughter or granddaughter).